The Philadelphia Cricket Club hasn’t even officially unveiled the renovations to its Wissahickon Course in Flourtown, yet the club is beginning to reap the rewards. The PGA of America will announce on Tuesday that in 2015 the Cricket Club will host the 48th PGA Professional National Championship, the biggest tournament in the country for club pros. The Cricket Club, designed by A.W. Tillinghast and one of the elite courses in Philadelphia, closed for renovations soon after the U.S. Open at Merion in June. The club is set to showcase the changes in the spring. PALM BEACH GARDENS, Fla. – The Philadelphia Cricket Club, the only country club in America to have opened a golf course in each of the past three centuries, has been selected to host the 48th PGA Professional National Championship presented by Club Car, Mercedes-Benz and OMEGA, June 21-24, 2015. It marks the second time the PGA of America’s showcase event for PGA Professionals will be hosted in the Philadelphia PGA Section. The Championship will bring a field of 312 to Philadelphia Cricket Club, located 20 minutes northwest of downtown Philadelphia, Pa. The Championship will utilize the Wissahickon Course (formerly Flourtown), built by renowned golf architect A.W. Tillinghast in 1922; and the Militia Hill Course, a 2002 design by Dr. Michael Hurdzan and Dana Fry. Wissahickon, named after the creek that borders one side of the property and dedicated to Tillinghast, will host the Championship’s final 36 holes. 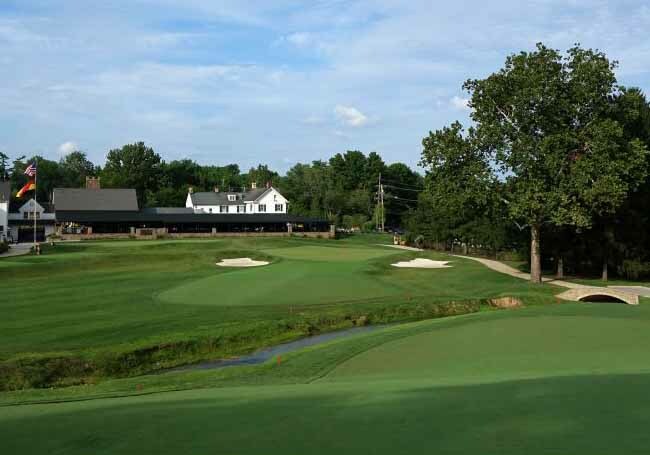 "It is exciting to have our PGA Professional National Championship coming to Philadelphia Cricket Club, a venue that connects much of the early history of golf in this country with the design excellence of A.W. Tillinghast, who was a key advisor at our founding nearly a century ago," said PGA of America President Ted Bishop. "Our talented field of PGA Professionals will find a great test at Philadelphia Cricket Club and we anticipate that an outstanding Champion will be crowned in 2015." "We're very honored to host the 2015 PGA Professional National Championship, with our historic Wissahickon Course designed by our legendary member, A.W. Tillinghast," said Philadelphia Cricket Club 2015 Tournament Chair Bob Bauer. "After years of research and planning, the club hired Keith Foster, a Tillinghast golf course restoration specialist, to return the original and distinctive features to the course and bring it up to date to account for changes in golf technology. We are confident this historic course will provide a worthy test for the finest PGA Professionals competing in this prestigious Championship. We look forward to welcoming the PGA of America in 2015." Wissahickon’s restoration will be complete this May. Since 1887, Philadelphia Cricket Club has been the site of both Golf Association of Philadelphia and Philadelphia PGA-sanctioned championships. The par-70, 7,119-yard Wissahickon highlights Tillinghast’s unique strategic bunkering, contoured greens, and narrow fairways. Wissahickon, a past member of "America’s Top 100 Courses" by Golf Digest, has hosted numerous state and local championships and has been a multiple honoree as a "Top 100 Classic Course." Militia Hill, a par-72, 7,199- yard design, was named in honor of the surrounding parkland, which commemorates George Washington’s last encampment before Valley Forge. The course was dedicated to Willie Anderson, a former Philadelphia Cricket Club Professional, who was one of four players to win the U.S. Open four times. Militia Hill has been a regular "Top 25" Golf Digest selection in Pennsylvania. "We have a fantastic membership that I know is looking forward to hosting this National Championship," said Philadelphia Cricket Club PGA Director of Golf Jim Smith Jr. "Wissahickon and Militia Hill are two distinctly different courses, but complement each other so well. Militia Hill received rave reviews for its design and conditioning while hosting multiple Section and Golf Association of Philadelphia events. Our membership is confident that the restoration of Wissahickon will have this Tillinghast design mentioned as one of his finest classic courses." Begun in 1968, The PGA Professional National Championship provides additional playing opportunities for PGA Professionals. In over four decades, it has become the showcase event for PGA Professionals, featuring some of the finest players in the Association. The Championship’s 312-player field represents 41 PGA Sections, with its 20 top finishers earning a berth in the PGA Championship. The National Championship is televised live by Golf Channel to viewers across the U.S., Canada, China, Japan, Korea, Latin America, Malaysia, the Middle East, Scandinavia, and Singapore. Last year’s PGA Professional National Championship reached a potential audience of 110 million. This summer’s 47th National Championship will be contested June 22-25, at the Dunes Golf & Beach Club and Grande Dunes Resort in Myrtle Beach, S.C.